Where's a QR Code When You Need One? So I dropped into Hardee's to get the kids some of their cheap $1 sodas (32 oz., good deal!). As we loaded up on 128 ounces of soda, I noticed that they had this interesting ad for a Hardee's app! I got interested when I noticed the iPhone and Android app availability. Plus, who is going to ignore that headline "FREE FOOD OR PRIZES." So right there, while waiting for the kids, I decided to download the app. Now, they do have link straight to a webpage on here: http://happystarrewards.com/. It opens directly into an app download. It is a GPS checkin app for anytime you are at a Hardee's or Carl Jr's. I finally got myself a decent QR code scanner and this was an instance that would have made a QR code most valuable. Send me straight to the right appstore where I can get this sucker that much faster. Most instances I've seen have been downright AWFUL uses of QR codes, mostly just sending you to the company website, but this was one that could have used it. 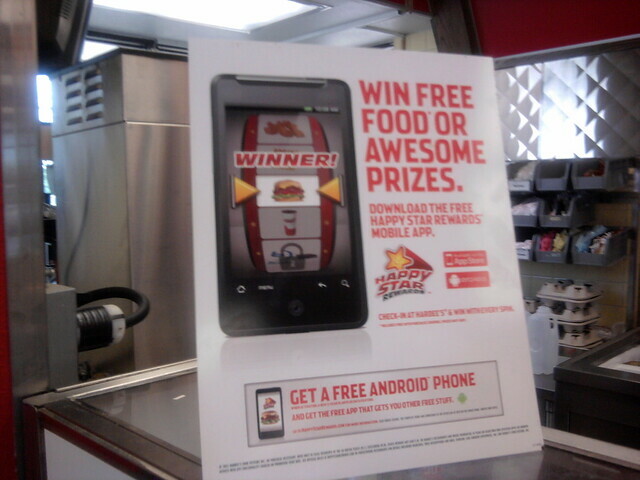 Good on Hardee's for using the app though.